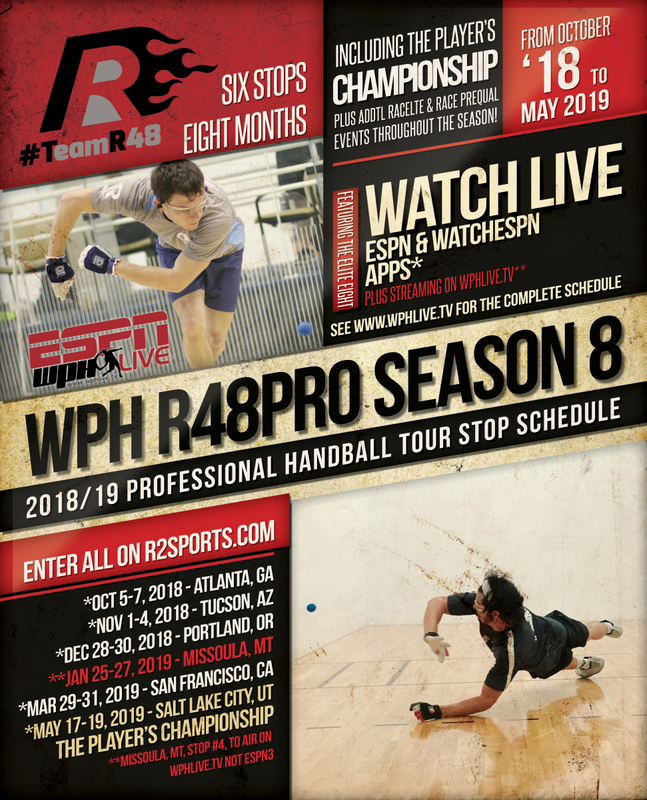 The World Players of Handball is thrilled to announce the 2018/19 Race 4 Eight Men’s Pro, Women’s Race 4 Eight, and Senior Race 4 Eight tour seasons, featuring nine events starting in Atlanta, GA in early October and ending with the Aces Race 4 Eight Player’s Championship seven months later in Salt Lake City, UT. 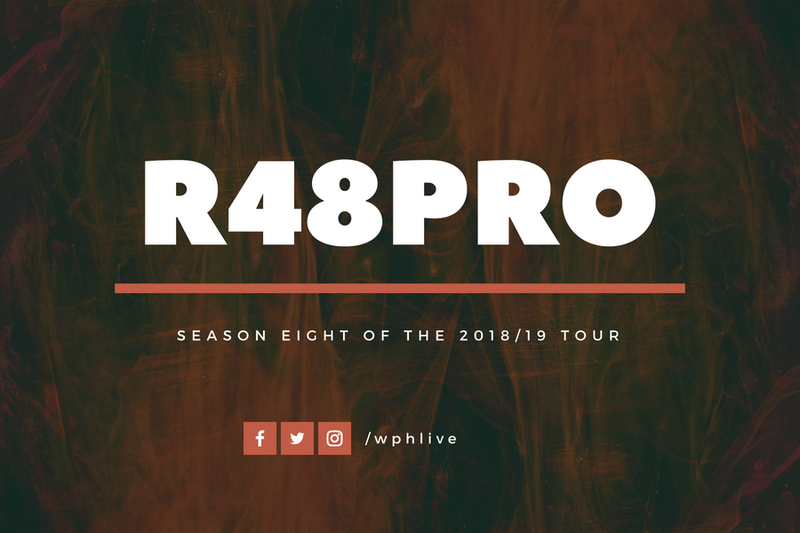 The Race 4 Eight Men’s Pros will compete in six “full” R48 stops and three R48LTE stops, with all nine events counting towards the official R48 Power Rankings, while the WR48 and SR48 pros will each compete in three ranking events during the 2018/19 season. Last season’s R48, WR48, and SR48 tours produced dozens of sensational moments and electrifying matches and this season promises to be even more exciting, as the best players in the world will showcase their tremendous talents on the sport’s most exciting platform. See the full 2018/19 Race 4 Eight tour schedule and entry links below. Welcome to the 2018/19 Race 4 Eight Season 8 of the professional indoor 4 wall handball tour, administered by the World Players of Handball [WPH; WPHLiveTV]. We at the WPH truly appreciate your dedication to our organization and your attempt to help us grow the sport of handball. As always, the WPH staff, board of directors, and members are constantly seeking to improve the playing experience for the fans, broadcast viewers, sponsors, advertisers, hosts, players and ESPN, to name just a few. As we do each season, we survey players and viewers with hopes of making each year better for all involved (i.e. rules, sites, player expectations, sponsor relations, staff expectations, referee responsibilities, scoring formats et al). This past season was no different. Please note, our goals are to expose and expand the game of handball; not hurt the integrity of the game or harm the fabric or history of the sport. Please read the full 2018-2019 R48Pro Code of Conduct & Guidelines (Below). Once there, you will find similar details and explanations from previous years, plus additional updates and some subtle changes, if any. WPH fundraising- The R48 is supported solely by donations and membership support. The voluntarily assistance of players, when asked, is needed and appreciated. Webcast support- The tournaments are broadcast on ESPN or WPHLiveTV by the WPH broadcast team and cooperation of the players by participating in interviews and assisting in commentary is needed and appreciated. Each Qualified and Elite R48, SR48, and WR48 Player must volunteer w/booth time at each event, outside of pre and post-match interviews and Q&A’s with ESPN reporters. In-match Coaching- Coaching is permitted before and after the match; during official 60-second timeouts and between games. Coaching is not permitted during towel timeouts, equipment timeouts, player/referee discussions, 30-second timeouts, or any other non-official timeout (i.e. during play). Coaching violations could result in technical point penalties, removal of coach from the gallery, or forfeiture from the event for the player and coach. Coaches are asked to be respectful of the opposing player and should not be heard giving instructions or requesting appeals at any point during a match. Penalties will be left to the discretion of the referee and/or tournament referee. Hearing a coaching yelling or screaming demands during a match will not be acceptable. *Some of the activities above are voluntary and some are requirements and, in the past, have been honored by the majority of the WPH players. These activities are not intended to overly burden the players but are designed to make each tournament successful. In Conclusion- By accepting your invitation to play in a Race 4 Eight event (if Elite Eight, Women’s Pro, 40+ SR or Qualifier), you agree to the terms printed on this document. If any member of the team does not perform the tournament duties listed in a positive and enthusiastic manner, that member will not be invited to the next event and will be only allowed to participate in future events by having a request to be reinstated approved by the full WPH board of directors. The decision to not invite an otherwise eligible player to a tournament will not be made lightly by the WPH board of directors based upon recommendations by tournament observers. Examples of violations, which are severe enough to result in non-invites are, but not limited to, refusal to referee, refusal to wear WPH approved gear, refusal to attend sponsor or WPH tournament function (i.e. Blind Draw Ceremony, VIP Banquet, etc.) and behavior which is offensive to sponsors, staff, players or viewers, to name just a few. If you have any questions regarding the agreement or any grievances, concerns, or suggestions, please email the full WPH BOD at support@wphlive.tv and the WPH Board of Directors will address the concerns or comments. Below are the rules for the R48Pro, WR48 and SR48 tours, to include scoring formats, prize money payouts, bonus money payouts, player invites, appropriate on-court gear, memberships, ranking points breakdown, R2sports tournament information, refereeing, draws, clinics and more. The WPH Player’s Agreement is in affect for qualifiers, pro men, seniors and elite women, plus all divisions that offer prize money. It’s the player’s responsibility to contact the WPH requesting a copy of the agreement before every event (Separate document associated with this code, but not to be confused with this document.) Not agreeing to or ignoring this document will result in a forfeiture of ranking points, cash prizes and ability to continue the tour; All Players may be sent a survey following each event by the WPH Rules Committee to assess his/her compliance with the WPH Player Agreement; This survey will be reviewed by WPH committee(s). WPH Rules apply only to WPH Sanctioned events and will not apply at ranked events outside of WPH sanctioning, in some cases. See the WPH for clarifications. The top 4 Ranked Senior 40+ and Women’s Elite, plus top 8 ranked men’s pros, from the R48 8 regular season (post San Francisco ‘19) of 2018/19 may be given housing or other accommodations and/or free entry into the Player’s Championship; contingent on being compliant with the WPH Player Agreement; qualifiers will be added to the R48 Men’s Pro main draw after the qualifying process in Salt Lake and players outside of the invited ones are encouraged to participate. A non-invited player could gain enough ranking points to catch up and pass an invited player; thus, receiving bonus money, ranking points and more! Please join us and play. All players must be an active member of the WPH, holding a current Player’s Card, prior to their first match of the event to qualify for prize money & ranking points. A player w/out a current membership before their first match will be allowed to play but will not receive cash & prizes and, in some cases, ranking points; it’s the player’s responsibility to communicate with the WPH; Player’s Cards will be sold at the venue for $20 or on line at thehandballstore.com. *WPH admins advice: purchase the Mando Ortiz Special: $100 for a five-year Player’s Card!! If you are competing in the main draw, you must fill out the name/information ledger prior to your first tournament match. Players in the main draw will not be permitted on the court for their first match until the ledger is completed. Checks will be handed out on Sunday morning by WPH staff or mailed w/in 14 days to those who filled out ledgers. Players who do not fill out ledgers will not receive prize money. It’s up to the player to be proactive regarding the ledger. Ask the WPH for a ledger now and keep on file. For those from Ireland or other foreign countries that have not filled out the proper IRS paperwork will not receive prize checks until all official government documents have been penned. Ranking points breakdown per event: 1st: 10, 2nd: 8, tie 3rd: 6, 5th: 4 points, 6th: 3.5 points, tie 7th: 3 points, 9th: 2 points, 10th: 1.5 points, tie 11th: 1 point, 13th: .5/.4/.3/.2 points, *13-16 place points will be determined by most points scored in the first round of the 9-16 playoffs *17th: 0.1 (17th if court space and availability) See the WPH for clarification. The 2018/2019 R48Pro VIII season will allocate the same amount of points for every race stop; no double points; Note: a player may win a round to receive payment/prize money/ranking points – a “bye” is not considered a win. A player who forfeits or is disqualified from a match may not receive points or cash. All WPH brackets (SR40+, Women, Qualifiers & Elite Men) will be awarded a 4-minute break between games and halftime in 25-point matches; all R48, SR48, and WR48 main draw scoring will sync at 15-15-15, win by two; qualifier and R48, SR48, and WR48 playoff matches, remains at one game to 25, win by two. Paid referees for R48pro, SR48pro & WR8pro matches will receive $20 per main draw match ($30 if the match is LIVE on ESPN). Main Bracket Playoff matches bring no fee unless it is aired on ESPN. Refs are paid $30 for the final of Men’s, Senior & Elite Women. In all cases, players who referee will contact the WPH within 14 days of the match they reff’d w/an invoice requesting payment that includes: Player’s Name, Social Security Number, Address, Email Address and total amount due. Player shall also list the match(es) reff’d, round of play, opponents, and whether it was ESPN filmed. WPH will pay the player w/in two weeks following the invoice completion and approval. After two weeks’ time, the WPH will consider the tournament closed. Unpaid matches will be viewed as donations (TY in advance). Please ask the WPH for a sample invoice. All WPH Players are asked to referee two matches in their entered bracket. A player will forfeit ranking points or prize money if referee responsibilities are not met. Ref’s who lost and are forced to ref the next match will get reimbursed (see above). *Finding a suitable replacement to referee is acceptable, but if that replacement does not show or is late, the blame falls on the player, not the replacement. Beware! Incentives, airfare, hotels, entry fees and cash considerations, also known as, Player Travel Money, can be granted in some form, after player agreement evaluations, based on the player’s previous tournament’s PA score. Out of good faith, the top 4 Elite Women & SR 40+ -and- Elite Eight Men will have their first event entry fee paid by the WPH at the 2018 Race Stop #1 (R48: Atlanta, WR48: Tucson, SR48: Tucson). All Elite Players must contact the WPH one month before the entry deadline to receive this special beginning of the year bonus. It is the player’s responsibility to enter and pay for their entry into WPH events (Note: WPH doesn’t receive entry fee money from the hosts and will not comp players. A player could lose their invite by not signing up in time). Power Rankings are a 12-month rolling system ranking the R48Pro’s best five of seven events through the R48 8 Tucson Memorial ’18, the best six of eight events following the R48 8 Portland ’18 through the R48LTE NYAC ’19, and best six of nine events following the R48 8 Aces Salt Lake City Player’s Championship ’19. Player compliance to the WPH Player Agreement will be combined with the rankings for invites and seeding. The qualifier is open to the first 32 to enter, unless otherwise posted, on a first come first serve basis. WPH may increase the qualifier to allow 46 or more players; likewise, there may be less than 32 also offered. All qualifier matches are on Friday morning at 9am unless specified (ie Thursday evening). The qualifiers will play down to the final eight (or pre-determined number) w/just the qualifier winners advancing; unless previously stated. WPH may alter qualifier formats depending on the numbers of players in the event (Ie. 32 players equal 8 brackets of four w/each bracket yielding one qualifier winner –or- 16 total players equal 4 brackets of four bringing two qualifiers from each bracket, et al). WPH will determine the format after the entry deadline. *R48 Pre-Qualifier winners in which two players in the R48 top 25 entered are given direct entry into the R48 main draw and will choose the stop in which he/she wants to use his/her direct entry. Thus, there could potentially be a R48 stop in which the qualifier may offer just 5-6 spots. 2018/19 R48 8 Power Rankings: In an effort the reward the R48 players playing the best handball, the 2017/18 R48 7 ranking points will be cut in half at the start of the 2018/19 R48 8 season. The 2018/19 R48 8 season will award full R48 ranking points for all R48 stops and half ranking points for R48LTE stops (see “Ranking Points Breakdown Per Event”). If, for example, a player made the semis at the 2018 R48 NYAC, earning six ranking points, that would be changed to three ranking points entering the 2018/19 R48 8 season. Elite 8 Bonus monies to be awarded to the approved final eight ranked pro men post Salt Lake ’19: 1st: $7,500; 2nd: $5,000; 3rd: $4,000; 4th: $3,500; 5th: $3,000; 6th: $2,500; 7th: $2,250; 8th: $2,000 (and subject to change pending participation). In case of a tie in final points, the WPH will first look at in-season head-to-head matchups; if a tie still occurs, the WPH will pool the player’s bonus winnings and then divide equally between the players. In all cases, bonus money will come to only those that are ranked in the final eight after the season’s conclusion and to those in attendance who played at least one full round at the Player’s Championship; to those that comply with the Player’s Agreement; within two weeks of receiving the Player Survey. *If multiple players tie for a top eight bonuses and if any of these players occupied a non-top-8-ranking prior to the Player’s Championship, the WPH will pool monies after first projecting payouts, before calculating the final bonus. See WPH for clarification. The Power Rankings are a 12-month rolling system that rank all the SR events. This season, events will be immediately removed after 12 months, and replaced by the most recent version of the event. If an event is not held, that event will be removed. Season Eight will use the results from these 2018 SR48 stops: Las Vegas ‘18, Houston ‘18, and SLC ‘18 – Counting new results for Tucson ’18, New Orleans ’19 and Salt Lake City ’19. 2018/19 R48 8 Power Rankings: In an effort the reward the SR48 players playing the best handball, the 2017/18 SR48 ranking points will be cut in half at the start of the 2018/19 SR48 season. Senior 40+ Payouts (Tucson ’18, New Orleans ‘19, Salt Lake City ’19): 1st: $1,250; 2nd: $750; 3rd: $500; Possible Additional Payouts or reductions depending on the numbers of players in the draw. Note: a player must win a round to receive payment – a “bye” is not a win. Appearance- SR48 players will dress appropriately for matches, which includes wearing WPH approved clothing during all filmed matches. Sponsored players can wear their sponsored gear w/WPH logo attached. See the WPH for clarification. Visit com for WPH approved gear. *We have had several of the SR48 pros not honor the WPH dress code in previous seasons; those players not wearing WPH approved gear will either not be permitted to play and/or not given prize money and/or ranking points. This rule goes for Women and Elite Men; qualifiers and all WPH prize money divisions and is not exclusive to just Senior 40+. All WR48 matches will be played with the Red 21 ball. 2018/19 R48 8 Power Rankings: In an effort the reward the WR48 players playing the best handball, the 2017/18 WR48 ranking points will be cut in half at the start of the 2018/19 WR48 season. Elite Women Payouts (Tucson ’18, San Francisco ‘19, Salt Lake City ’19): 1st: $1,250; 2nd: $750; 3rd: $500; Possible Additional Payouts depending on the numbers of players in the draw. Note: a player must win a round to receive payment – a “bye” is not a win. The WPH is committed to training referees to be competent and successful in all Race 4 Eight circumstances. Below is a guideline to help improve a referee’s called match; from the rules in the 15-point / 25-point formats to complicated interpretations of hinders, injury timeouts and stalling. USHA rules chairman, Tom Sove, has been consulted extensively to provide our players and staff with all the knowledge they will need to be confident and assertive when refereeing a match. We understand that no referee is perfect, but our goal is for our referees to be as well prepared as possible for each event. Please read the Referee Guidelines + WPH Rules below, and as always, email the WPH with any questions. Players are not to address the linesman at any time. All complaints must be diplomatic and go only through the referee. Arguing, intimidating, influencing, etc., the linesman will result in a technical violation. Referee gives the player a couple seconds to vent (if no vulgar language is used) while not engaging. Players are given two incorrect instant replay challenges per game (11, 15, 21, or 25). If instant replay upholds two calls or is inconclusive, the player has lost his or her replay challenge for that game. Unused replay challenges do not carry over to the next game. Please ask prior to the match or event if replays will be available. Referee will allow players 10 minutes to warm-up on the court in which they are playing once the court has become available. Players are encouraged to warm-up on adjacent courts if they do not feel that 10 minutes is sufficient. Referees will start the match 10 minutes after the court is available or when the TV space opens. Non-prepared players will lose timeouts, then points, then technical. See Dave Fink for details. Wiping of eye guards should only be done during legal time outs and during the two 10 second intervals of the”10 second rule”. A player is not granted extra time to wipe eye guards. The referee can also impose an unsportsmanlike technical (loss of point) for unnecessary diving to wet the floor, intentionally wetting gloves, etc. What can the referee do in these situations? Rule 4.9 Technical(s) A. 9). This is unsportsmanlike delay of game. You can give a technical warning or warn him/her before the tourney match starts and let them know you know what he/she is doing and to stop it. Or, you can warn him/her and then fine them $100 for every flop. That would be an association decision, not rule book decision. The NBA does it now. ***The WPH has now adopted this “Delay of Game,” rule. $100 fine will be implemented for Unsportsmanlike Delay of game. This penalty can be assessed by the referee or WPH Administrators at the time of the play in question, or before the event ends after reviewing the match. A player cannot appeal this ruling during the match but can appeal to the WPH rules committee after the tournament ends. Player excessively towels the floor after each rally, including parts of the floor on the other side of the court from which he/she dove. Go back to the first question. Unsportsmanlike delay of game. The ref is in charge here. He/she should be directing the wipe activity and calling for the towel. The players have the right to a dry court, but the ref decides if the court needs wiping. And note that the maximum time allowed for wiping is two minutes, it does not say the players have the right to two minutes. The ref gets to decide how much time he/she wants to give for this. If the player wants to wipe in a different spot, then he/she should ask permission. Max time for an equipment time out is also two minutes, but the referee can make this time shorter; it is not required for the player to take two minutes for a headband, for example. Additionally, during a towel time out, both players shall remain on the court. Any player leaving the court must get permission from the referee. Delay of game if they leave before being allowed to. Player dives and lays on the floor for an additional 10-20 seconds before asking for the towel, accumulating 45-60 seconds of delay. More of the same, but is this systemic behavior? If the ref wants to be a stickler, he/she can strictly interpret Rule 4.1 Serve E. Time. He/she can say the receiver’s 10 seconds have elapsed, and then call the score, then say the server’s 10 seconds have elapsed and therefore side out. But the ref should know the rule and enforce it fairly, including giving a heads up by calling the score in there somewhere. Returning player overly-inspecting/ask for the ball from the server to disrupt the rhythm of the server. Obvious stalling: The referee determines that a player is intentionally stalling because he/she is trying to break the rhythm of his opponent or to recover from long rallies. Is a back spasm considered a cramp? What exactly is the “reasonable amount of time” given to the server and the receiver after the referee calls point or side out? Does the “reasonable amount of time” should be 10 seconds or could the “reasonable amount of time” be less than 10 seconds. For example, server serves a crack ace right in front of the returner, neither the server nor the returner moved more than a foot during the one-shot rally. Does the referee need to wait 10 seconds to call the score? Can a catchall rule be implemented: anything that’s unsportsmanlike or delay of tourney as deemed by the tourney director’s results in a technical, a deduction, or a forfeiture.